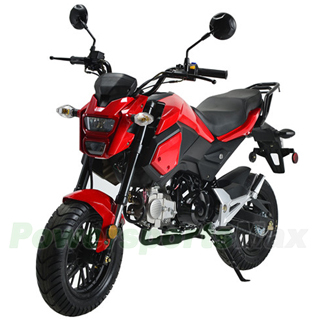 Feisty 125cc, Single Cylinder, air-cooled, 4-stroke engine puts out strong, predictable power with incredible gas mileage. Manual Transmission Pro biker's choice! Front and Rear Disc brake supply strong, reliable stopping power. 120/70-12 front and 130/70-12 rear tires offer great traction. Large headlight and taillight maximizes nighttime visibility and electroplated headlight housing enhances styling. This bike is legal for sale in California and can be registered in California DMVs. This model is not for sale in New York, Colorado, Florida, Pennsylvania, New Jersey. Shipping charge for one single unit of MC-N020 is $239.95(Please login to see real shipping charge for these states: Florida, New York, District of Columbia, Connecticut, Maine, Maryland, Massachusetts, Montana, New Hampshire, New Jersey, Pennsylvania, Rhode Island, Vermont, West Virginia, Delaware, etc.) , and you will get discounted shipping price if you order multiple item.